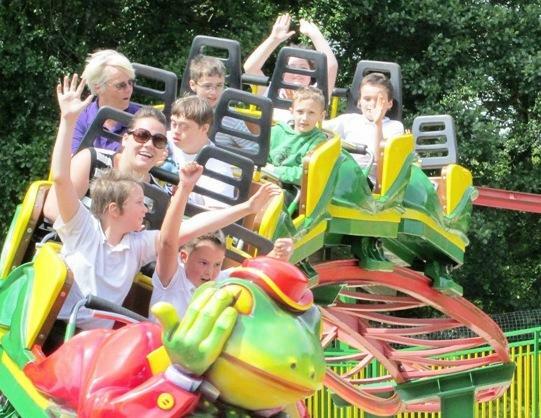 Newbury Rotarians enjoy a fun day out at Paultons Park with local children from Castle School. Difficult to say who enjoys it more! Every year Rotarians all over the UK team up with Kids Out to take disadvantaged children on a special day out. This year will see the 26th consequetive yearof these events. The first Kids Out took place in 1990 and was organised by Kingston Rotary in conjunction with Littlewoods. The event has grown in popularity ever since and this year over 30,000 children will have enjoyed a day out across the UK. Newbury Rotarians this year will take 42 children and 28 helpers from Castle School, Newbury to Paulton's Park. There they will joined by 1500 children and a further 1000 helpers and Rotarians from across Hampshire, Berkshire, Dorset and the Isle of Wight. This is a great day on the rides, hopefully enjoying the sunshine! Smiles and laughter all round. Read what Castle School Head Teacher had to say about the Kids Day Out last year.